Once in a while, we at Northern Basement Systems hear from a homeowner who's found a gelatinous, rust-colored substance making its way into a basement. This substance also appears around faucets, in toilet water tanks, and within other plumbing. For a free, no-obligation iron ochre waterproofing system quote, contact us by phone or e-mail today! We serve Burlington, Keene, Colchester, and many nearby areas in Vermont and New Hampshire. According to a study conducted by the University of Florida, less than 10% of drainage installations are affected by iron bacteria infestations. 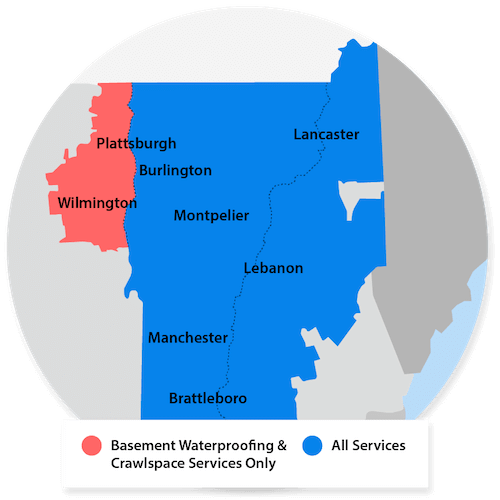 Our service area includes Colchester, Keene, Burlington, as well as Laconia, Rutland, Bennington, South Burlington, St Albans, Montpelier, Brattleboro, and many areas nearby.